Welcome to the St. Joseph Learning Commons and Student Success Bookclub! The Purpose: We will read "Hold On To Your Kids, Why Parents Need to Matter More than Peers" by Dr. Mate and Dr. Neufeld in an effort to bring parents and teachers together as partners to re-create the 'Attachment Village'. The Plan: In May we will read Part 1, in June, Part 2, in July, Part 3, in August, Part 4 and in September Part 5. As we read each section, we may respond to the discussion questions available on the sidebar pages. Parents and Teachers may respond anonymously by posting their comments, or use the questions as an opportunity for private self-reflection. The Party: In October, we will meet as a group and discuss the findings of the book and our responses to it over food and drink. We will also brainstorm ways to bring the information to our friends and colleagues through workshops or presentations. To celebrate Education Week and to develop stronger partnerships with parents in our community, Tracy Murray (Student Success Teacher) and I, Sarah Murray (Teacher-Librarian) are proposing a bookclub for both parent and teacher readers. 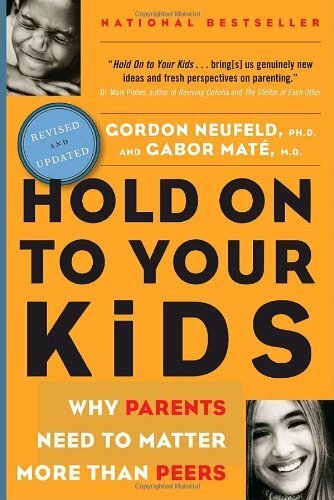 We will read Dr. Mate and Dr. Neufeld's book, "Hold Onto Your Kids". Their thesis is that many children are no longer attached to their parents as the emergence of a new and omnipotent peer culture is luring them away from adult influence. Children are so strongly and deeply peer-orientated that we as educators have difficulty creating relationships with them in order to influence students to learn. As parents, we may not realize that the change in the behaviour of our teen is not always due to hormones or teen angst but may be due to the alienating effect of peer-orientation. This books speaks to the obstacles that prevent or seriously hinder student engagement in our classrooms. These parenting experts argue that many of the behaviours teens exhibit: aggression, violence, anxiety, depression, suicidal tendancies etc. are the result of extreme peer-orientation and are relationship problems and not behaviour problems. WHY READ? The hopeful message is that children naturally want to be attached to adults and that recreating the village of adult leadership is possible. The book offers positive support for adults to encourage them to trust in their natural instincts to parent/lead children. It is not another handbook of tips or tricks to control children and make parents feel bad about themselves. The next step will be to organize workshops with the authors on specific topics for parents and also one for teachers. The long term goal is to provide support to teachers with promoting student engagement, and creating a sense of belonging for students in classrooms. THE PLAN: We will launch the bookclub at Open House with a meet and greet informational session with parents. We will read the book from May to September and meet socially at various times to discuss certain chapters. To show on-going communication between parent and teacher readers, we will contribute to a group blog to offer and respond to observations that arise from our reading. The next step will be to organize workshops with the authors on specific topics. The long term goal is to provide support to teachers with promoting student engagement, and creating a sense of belonging for students in classrooms and to also provide workshops to help parents re-establish relationships with their children who are becoming too peer-orientated. RSVP: to Sarah Murray if you would be interested in joining this book club.